WEIBER clean room ovens are special ovens to work in clean room environments. Clean ovens are used specifically for heat treatment and applications for air requirements of class 5, class 100, class 1000 etc. Variety of high performance models to choose from which ensures automated operations and dedicated cleanliness even throughout temperature heating up and cooling operations. These ovens feature an exclusive air flow pattern that assures unsurpassed temperature control and uniformity and quick recovery times. A stainless steel blower, driven by constant speed induction motor, circulates air throughout the oven. Easily accessible interior for maintenance and cleaning. Equipped with safety devices and high temperature protection. Lockable doors with mobile updates. Class 5/10/100/1000 etc cleanliness levels: high levels of cleanliness areachieved by employing HEPA filters and a back to front horizontal laminar circulation system which produces uniform high temperature airflow. Airtight structure ensures zero contamination. Automated operation throughout heat treatment process: an automatic damper is provided for automation in all processes from temperature heat up to heat treatment and temperature pull-down. 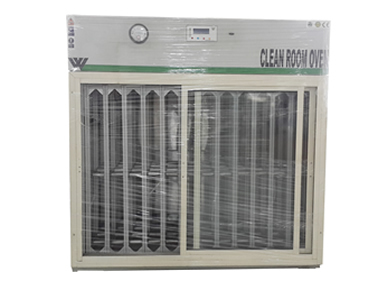 WEIBER clean room ovens are double walled convection heated and cooled units. Outer body are constructed out of thick PCRC, pre coated corrosion resistant GI sheet duly pre-treated with primers and rust proofing and painted with long lasting stove enamel or elegantly powder coated. The inner chamber is made of heavy gauge stainless steel sheet of SS-304 grade). The gap between the walls is filled high grade mineral glass wool, which ensures maximum thermal efficiency in our ovens. Heating: Indirect heating system is provided in our units, comprising of air heaters made of high grade Kanthal/Nichrome wires of suitable wattage. Temperature Control: The temperature inside our clean room ovens is controlled through Nano technology based ergonomic controller (HMI+PLC optional). Temperature Range: Temperature range of clean room ovenis 250o C.